CD8+ T cell responses are known to be important to the control of HIV-1 infection. While responses to reverse transcriptase and most structural and accessory proteins have been extensively studied, CD8 T cell responses specifically directed to the HIV-1 enzymes Protease and Integrase have not been well characterized, and few epitopes have been described in detail. We assessed comprehensively the CD8 T cell responses to synthetic peptides spanning Protease and Integrase in 56 HIV-1 infected subjects with acute, chronic, or controlled infection using IFN-γ-Elispot assays and intracellular cytokine staining. Fine-characterization of novel CTL epitopes was performed on peptide-specific CTL lines in Elispot and 51Chromium-release assays. Thirteen (23%) and 38 (68%) of the 56 subjects had detectable responses to Protease and Integrase, respectively, and together these targeted most regions within both proteins. Sequence variability analysis confirmed that responses cluster largely around conserved regions of Integrase, but responses against a large, highly conserved region of the N-terminal DNA-binding domain of Integrase were not readily detected. CD8 T cell responses targeted regions of Protease that contain known Protease inhibitor mutation residues, but strong Protease-specific CD8 T cell responses were rare. Fine-mapping of targeted epitopes allowed the identification of three novel, HLA class I-restricted, frequently-targeted optimal epitopes. There were no significant correlations between CD8 T cell responses to Protease and Integrase and clinical disease category in the study subjects, nor was there a correlation with viral load. These findings confirm that CD8 T cell responses directed against HIV-1 include potentially important functional regions of Protease and Integrase, and that pharmacologic targeting of these enzymes will place them under both drug and immune selection pressure. In HIV-1 infection, virus-specific CD8 T cell responses are readily detected in peripheral blood and lymph nodes, but HIV-1 replication typically persists in the face of an exuberant CD8 response [1–3]. Although ineffective at eradicating virus, HIV-specific CD8 T cells nonetheless play an important role in decreasing viremia. In SIV-infected macaques, depletion of CD8 cells results in uncontrolled infection [4, 5]. In human studies, partial control of viremia during acute infection correlates with the appearance of HIV-specific CD8 T cells [6, 7], and some reports have suggested that there is an inverse correlation between the CD8 response and HIV-1 viral load, although this remains controversial [8–11]. Escape from CTL recognition has been linked to disease progression in some studies [12–14], and recent population-based studies have confirmed that immune selection pressure mediated through HLA class I-restricted responses influence viral evolution, providing additional evidence that immune selection pressure persists in the chronic phase of HIV-1 infection . Thus, although the specific relationship between CD8 T cells and viral control in HIV-1 infection remains unclear, CD8 responses appear to be a critical component of an effective HIV-1-specific immune response [16, 17]. Significant efforts have been made to identify HLA-restricted CTL epitopes important for the control of HIV-1 infection, but this analysis remains incomplete. More than 300 peptides containing CD8 T cell epitopes have been reported to the HIV-1 Molecular Immunology Database, of which approximately 150 have been optimally defined . This work has largely focused on the HIV-1 proteins Gag p17, p24, Nef, Env and Reverse Transcriptase (RT). The distribution of epitopes targeted within these proteins is highly variable, with clustering in relatively conserved regions of the virus [19, 20]. Recently, studies have also identified CD8 T cell responses to several HIV-1 accessory proteins, including Tat, Rev, Vpr, Vpu and Vif, and shown that they comprise a significant percentage of the overall CTL response [21, 22]. In contrast, studies of CD8 T cell responses to two enzymes within the Pol gene, Protease and Integrase, have been limited. These proteins are relatively highly conserved, and also are targets for drug development that place them under pharmacologic selection pressure. Moreover, since both proteins are relatively highly conserved, they may be valuable targets for vaccine development. The potential dual selective pressures on these genes may have important clinical implications . Here, we describe the comprehensive assessment of the CD8 T cell response directed against Protease and Integrase in a large, diverse cohort of HIV-1 infected subjects, show that they are frequently targeted by HIV-specific CD8 T cell, and identify novel optimal epitopes that are frequently targeted. Fifty-six subjects with documented HIV-1 infection based on serologic criteria who are followed clinically at the Massachusetts General Hospital, the Brigham and Women's Hospital, the Fenway Community Health Center or the Lemuel Shattuck Hospital in Boston were recruited and divided into three groups based on disease characteristics. Twenty-eight subjects were identified, and began effective treatment, during acute HIV-1 infection, defined as within 180 days of seroconversion ("acute cohort"). Twenty-two subjects with chronic HIV-1 infection followed for routine longitudinal care were also studied ("chronic" cohort). Of these, thirteen were receiving effective antiretroviral treatment and nine were not receiving treatment at the time of study. Finally, six individuals who control HIV-1 infection without treatment, defined as repeated HIV-1 RNA measurements below 1000 copies/ml in the absence of antiretroviral medications, were studied ("HIV-1 controller" cohort). Clinical and immunologic aspects of several of these patients have previously been described [21, 24]. The study was approved by the Institutional Review Boards of the respective institutions, and all subjects gave informed consent for their participation. A subset of subjects in the acute cohort was studied while they were enrolled simultaneously in a study of structured treatment interruption in acute HIV-1 infection ; thus, for some acutely infected subjects, data both on and off therapy were obtained. Overlapping peptides 15 to 18 amino acids in length spanning the complete clade B consensus amino acid sequence of HIV-1 Protease (13 peptides) and Integrase (37 peptides) were synthesized on an automated peptide synthesizer (MBS 396, Advanced Chem Tech, Louisville, Kentucky, USA) by fluorenylmethoxycarbonyl chemistry. The algorithm used to design overlapping peptides has been described . Briefly, consecutive 18-mers overlapping by 10 amino acids served as the basic template. If the terminal amino acid was not a defined class I MHC anchor residue, a shortened 15-, 16- or 17-mer with a compatible anchor residue was synthesized instead. A ten amino acid overlap was maintained for all peptides. Truncated peptides (8- to 11-mers) used to map novel optimal CTL epitopes were obtained from Research Genetics (Birmingham, Alabama, USA). Protease- and Integrase-specific CD8 T cell responses were quantified by IFN-γ ELISPOT assay as previously described [21, 26]. Briefly, fresh peripheral blood mononuclear cells (PBMC) were isolated by Ficoll-Hypaque (Sigma, St. Louis, Missouri, USA) density gradient centrifugation. 100 μL of complete RPMI/10% fetal calf serum containing 0.5–1 × 105 PBMC were plated in each well of a 96-well polyvinylidene plate (MAIP S45; Millipore, Bedford, Massachusetts, USA) pre-coated with 0.5 μg/ml of the anti-IFN-γ MAb 1-DIK (Mabtech, Stockholm, Sweden). Individual peptides were added to wells at a final concentration of 1 × 10-5 M; wells without peptide served as a negative control, and phytohemagglutinin (PHA) was used as a non-specific activator of IFN-γ production to serve as a positive control. Plates were incubated overnight at 37°C. After washing with PBS, biotinylated anti-IFN-γ MAb 7-B6-1 was added at 0.5 μg/ml and incubated for 60–90 minutes at room temperature. After washing, 100 μl of 1:20,000 streptavidin-conjugated alkaline phosphatase (Mabtech) was added to each well, and individual IFN-γ secreting cells were visualized as dark spots after reacting with 5-bromo-4-chloro-3-indolyl phosphate and nitro blue tetrazolium (Bio Rad Labs, Hercules, California, USA). Specific IFN-γ producing cells (spot-forming cells, or SFC) were counted by direct visualization. Responses of greater than 40 SFC/million PBMC after subtracting the negative control value were considered positive; negative control values in all cases were less than 30 SFC/million PBMC. Intracellular cytokine staining assays were performed as described previously . Briefly, 0.5–1 × 106 PBMC were incubated with 4 μM peptide and 1 μg/ml each of anti-CD28 and anti-CD49 MAbs (Becton Dickinson, San Jose, California, USA) for one hour, followed by the addition of 10 ug/ml of brefeldin A (Sigma). Cells were incubated at 37°C for 6 hours, and then at 4°C overnight. Cells were then washed, stained with fluorescent-labeled CD4 and CD8 antibodies (Becton Dickinson), and then fixed and permeabilized using the Caltag Fixation/Permeabilization Kit according to the manufacturer's instructions (Caltag, Burlingame, California, USA). Fixed and permeabilized cells were then stained with anti-IFN-γ-fluoresceine isothiocyanate antibody (Becton Dickinson), washed and analyzed on a FACSCalibur flow cytometer (Becton Dickinson). In all but one detected T cell response, IFN-γ producing cells were exclusively CD8+. PBMC were expanded with a bispecific CD3/CD4b monoclonal antibody  for 10 to 14 days in R10 medium [RPMI 1640 medium supplemented with 10 mM HEPES, 2 mM L-glutamine, 50 U/ml penicillin, 50 μg/ml streptomycin and 10% heat-inactivated fetal calf serum (Sigma)] supplemented with 50 U/ml recombinant interleukin-2 (Hoffman LaRoche, Nutley, New Jersey, USA). Peptide-specific CD8 T cell lines were isolated from expanded PBMC as previously described, using 20 μM peptide in an IFN-γ catching assay . Peptide specificity of CD8 CTL lines was confirmed by flow cytometry, and lines were further expanded for an additional 7–10 days in the presence of irradiated feeder cells before use in epitope mapping and HLA restriction studies. HLA-restriction assays were performed using extensively washed, peptide-pulsed B-LCL as the peptide-presenting cell. HIV-1-specific cytotoxicity was assessed by 51chromium-release assay using an E:T ratio of 10:1. HLA-restriction of CTL epitopes was determined using a panel of target cells matched through only one of the HLA-A, HLA-B or HLA-C class I alleles expressed by the effector cells . HLA tissue typing was performed at the MGH Tissue Typing Laboratory using sequence-specific primer PCR. In some cases, putative CTL responses to overlapping 15–18 mer peptides were further fine mapped to define the optimal, HLA-restricted epitope, as previously described [21, 29]. Briefly, 8-, 9-, 10- and 11-mer truncations of the parent peptide were obtained (Research Genetics), and serial dilutions from 1 × 10-4 to 1 × 10-11 M were used in an ELISPOT assay. The optimal epitope was defined as the peptide that induced 50% maximal SFC at the lowest peptide concentration . where n a is the number of amino acid residues of type a, N is the number of residues in the sequence database, and K is the number of residue types. In the subsequent analysis, N was set equal to155 (the number of sequences analyzed) and K was set equal to 21, representing the 20 amino acids and an extra symbol for any gaps in the sequence. The program Scorecons http://www.biochem.ucl.ac.uk/cgi-bin/valdar/scorecons_server.pl was used for all calculations. Second, because few optimal epitopes have been mapped in Protease or Integrase, there are insufficient data to develop a score based on known CTL epitopes directed against each amino acid in the two proteins. Thus, for each amino acid position, the number of subjects in the current study with detectable responses against peptides containing that amino acid were summed and used as a measure of CD8 responses to that amino acid residue. 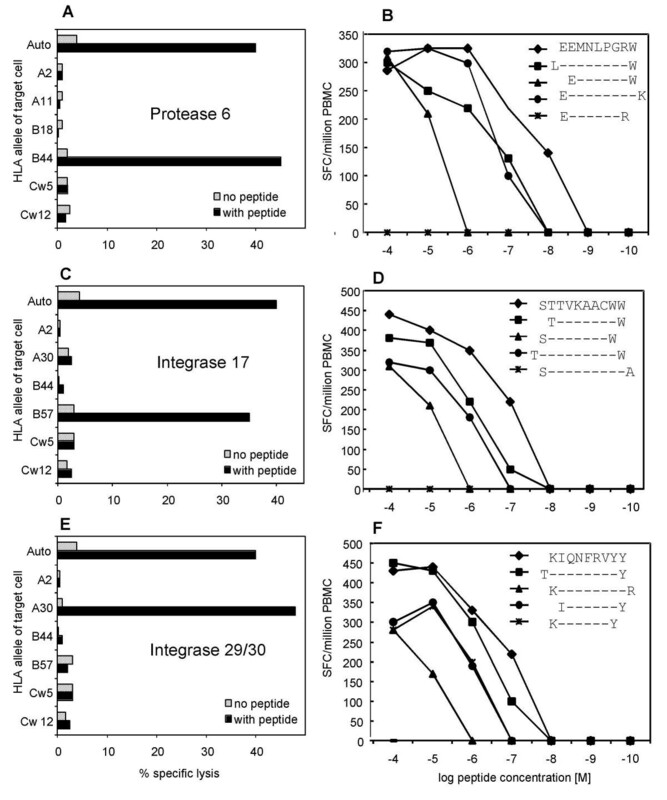 Raw normalized entropy scores were then correlated with the amount of CD8 T cell responses for each amino acid residue in both Protease and Integrase. Entropy scores were also smoothed over nine amino acids (corresponding to the size of a typical CD8 T cell epitope) and correlated with CD8 T cell responses. Correlations were made using the Spearman's rank-order correlation test . The HIV-1 Molecular Immunology Database was reviewed for reports describing CTL epitopes [18, 30]. Published reports of cohorts in whom subjects were comprehensively screened against peptides spanning the entire length of one or more HIV-1 proteins were identified [8–10, 24], and data on CTL frequency against individual HIV-1 proteins extracted for the comparison plot presented as Figure 5. A total of 56 HIV-infected subjects were studied, including cohorts with acute, chronic, and controlled HIV-1 infection, as depicted in Table 1. Cohorts were similar with respect to basic demographics and ethnic background, as well as CD4 cell counts. The expected differences in viral load between controllers and the other cohorts were seen. Mean log10HIV-1 RNA level in the controller cohort was 2.03 ± 2.15 copies/ml; mean value in the untreated chronic cohort was 4.52 ± 4.56 copies/ml. Acute cohort subjects had been infected for a mean 23 months (range, 1 to 49 months) at the time of study. Although all but one of the 28 subjects enrolled in the acute cohort began effective antiretroviral treatment at the time of enrollment, 12 subjects were subsequently enrolled in a supervised treatment interruption trial , and thus had CD8 responses measured while off therapy. a Values are mean +/- S.D. b Two patients in the acute cohort were evaluated at two different time points, once on therapy, once off therapy. We generated a series of 13 overlapping peptides (15 to 18 amino acids in length) spanning the complete HIV-1 Protease sequence, using the clade B consensus sequence  as a template (see Figure 1A for peptide sequences). Of the 13 peptides spanning Protease, a total of 10 (77%) were recognized by at least one study subject. Eight of these ten responses were confirmed as CD8-mediated by either CD4 cell depletion or intracellular cytokine staining; the remaining two responses could not be further evaluated due to sample availability. Thirteen of 56 subjects (23%) recognized at least one Protease peptide, with magnitudes ranging from 50 to 750 spot-forming cells (SFC) per million PBMC. The mean Protease-specific response in those recognizing this protein was 212 ± 202 SFC per million PBMC (Figures 1B and 1C and Table 2). These values are similar to reported CD8 T cell responses against other HIV-1 proteins [8–10, 24]. There were not statistically significant differences in the percentage of subjects responding to Protease peptides among the three cohorts, or in the magnitude of the responses. Of the 13 subjects with identifiable Protease-specific responses, most targeted only one peptide, although the single peptide targeted varied among the persons tested. The broadest Protease-specific responses were in two subjects, both in the acute cohort, each of whom recognized four of the 13 Protease peptides, two of which were overlapping and therefore suggested recognition of the overlap region common to both peptides. CD8 T cell responses to HIV-1 Protease. PBMC were stimulated with the indicated peptide in an overnight IFN-γ ELISPOT assay. Each row represents an individual peptide. (A) Amino acid sequence, using standard single-letter amino acid abbreviations. Numbers above peptide sequences refer to the amino acid position within Protease, with key Protease inhibitor mutation residues indicated in bold. (B) Bars represent the percentage of 56 study subjects who responded to the peptide in an ELISPOT assay. Peptides with the highest number of responses are shaded gray. (C) The magnitude of every CTL response detected in the study cohort. Each symbol represents a single CTL response against that peptide by one individual. Magnitudes of responses are shown after subtraction of background, which in all cases was <30 SFC/million PBMC. Closed circle (●): acute cohort. Open circle (○): chronic cohort. Shaded triangle ( ): controllers. a Values are SFC/million PBMC. b Two patients in the acute cohort were evaluated at two different time points, once on therapy, once off therapy. Although CD8 responses directed against the majority of Protease peptides were found, most of the individual Protease peptides were infrequently targeted by CTL. Only three peptides, Protease 3, Protease 6, and Protease 13 were recognized by more than two subjects; these were also the only peptides against which the mean magnitude of the CD8 response was greater than 250 SFC/million PBMC (Figure 1B and 1C). Protease 6 was the most frequently recognized peptide, targeted by five subjects (9%), and was thus chosen for further analysis and optimal epitope fine-mapping. Thirty-seven overlapping peptides spanning the complete HIV-1 Integrase sequence were used to assess CD8 responses in the same cohorts, also using the HIV-1 clade B consensus sequence as a template (Figure 2A). Twenty-six of the 37 Integrase peptides (70%) were recognized by at least one subject. Thirteen responses were confirmed as CD8-mediated by either CD4 cell depletion or intracellular cytokine staining. One response, against Integrase 29, was found to be CD4+ T cell mediated in one subject, and CD8-mediated in another subject, which suggests that this overlapping peptide contains both a CD4 and a CD8 T cell epitope. Unlike Protease, where a fairly uniform distribution of responses was seen across the entire protein, there were large regions in the Integrase sequence that were nearly devoid of CD8 responses. A stretch of nine peptides, Integrase 3 to Integrase 11, spanning 58 amino acids at the N-terminus of Integrase in the DNA-binding domain, were targeted by only three responses in the entire cohort of 56 study subjects (Figure 2C). Poorly immunogenic regions of Integrase were also seen at Integrase 18 to 22, Integrase 25 to 29, and at the C-terminus (Integrase 32 to 37). CD8 T cell responses to HIV-1 Integrase. PBMC were stimulated with the indicated peptide in an overnight IFN-γ ELISPOT assay. Each row represents an individual peptide. (A) Amino acid sequence, using standard single-letter amino acid abbreviations. Numbers above peptide sequence indicate amino acid position within Integrase. The conserved HHCC zinc finger-like domain and DDE element are indicated in bold. (B) Bars represent the percentage of 56 study subjects who responded to the peptide in an ELISPOT assay. Peptides with the highest number of responses are shaded gray. (C) The magnitude of every CTL response against Integrase peptides detected in the study cohort. Each symbol represents a single CTL response against that peptide by one individual. Magnitude of responses are after subtraction of background, which in all cases was <30 SFC/million PBMC. Symbols are the same as in Figure 1: Closed circle (●): acute cohort. Open circle (○): chronic cohort. Shaded triangle ( ): controllers. Thirty-eight of fifty-six subjects (68%) recognized epitopes within Integrase, with a magnitude of response ranging from 50 to 1500 SFC per million PBMC (Figures 2B and 2C, Table 2). The mean magnitude of the response was 320 ± 301 SFC per million PBMC. Four subjects recognized as many as five Integrase peptides; most subjects recognized a single peptide. Three Integrase peptides were each recognized by more than 10% of study subjects: Integrase 14, Integrase 24 and Integrase 30 (Figure 2B). The majority of the CD8 T cell responses against Integrase were clustered around these three peptides. Most of the previously described epitopes in Protease and Integrase have been defined based on predicted HLA-binding motifs, and published data on optimally-defined epitopes within Protease and Integrase identified directly from HIV-1 infected subjects are scarce [31–36]. We characterized the minimal amino acid sequences required for optimal recognition of the dominant Protease and Integrase peptides in these study subjects, as well as the restricting HLA class I alleles. Finemapping of the three novel CTL epitopes described in figure 3 was performed with cells from one patient, respectively. For each epitope peptide titrations were repeated and confirmed in at least one other study subject with a response to the corresponding 15 mer and the matching HLA type. In addition, the novel 9 or 10 mer was tested in all study subjects for which additional specimen were available. Fine-mapping of one novel epitope within Protease and two within Integrase. Peptide-specific CD8 cell lines were generated for three peptides, Protease 6, Integrase 17, and Integrase 29/30. PBMC collected from subjects with strong responses by ELISPOT were expanded using a bispecific CD3/4 antibody. Following expansion, peptide-specific cells were collected using an IFN-γ catching assay after stimulation with the appropriate peptide. Peptide specificity was confirmed by flow cytometry. HLA-restriction was then determined using peptide-pulsed target cells matched at only one MHC class I allele in a 51Cr-releasse assay at an E:T ratio of 10:1; peptide-pulsed autologous cells were used as a positive control. The sequences of the optimal epitopes were also determined by testing peptide-specific cell lines against serial dilutions of truncations of the original peptide in an ELISPOT assay. Data are shown for three epitopes: (A, B) – Protease 6. (C, D) – Integrase 17. (E, F) – Integrase 29/30. Five subjects had strong responses to Protease 6 (range 150 to 460 SFC/million PBMC). Using serial dilutions of truncated peptides, we identified the optimal epitope within Protease 6 as EEMNLPGRW (EW9, amino acids Protease 34–42), as shown in Figure 3A,3B. HLA restriction of EW9 by HLA-B44 was determined using a 51chromium release assay. Overall, 4 of the 8 subjects (50%) expressing the HLA-B44 allele and evaluated in our study responded to Protease 6 and the novel EW9 epitope. Although the optimal epitope EW9 does not include the primary Protease inhibitor mutation site M46, it does include residue M36, which is a known accessory mutation site in PI-treated patients. Using a similar approach to the fine-mapping of optimal epitopes and their HLA restriction, two frequently targeted CTL epitopes within Integrase were further characterized in detail. The most frequently targeted Integrase peptide is Integrase 30, which was recognized by 16% of study subjects. Several persons had responses to the adjacent peptide (Integrase 29), suggesting the presence of an epitope within the overlapping region of these peptides. Fine mapping confirmed the optimal epitope to be in the overlap region shared by both peptides, KIQNFRVYY (KY9), which was restricted by the HLA-A30 allele (Figure 3E,3F), an allele recently associated with decreased viral set point in non-clade B infection . Both individuals with a response to Integrase 29/30 recognized the 9 mer peptide. Sabbaj et al. also described this epitope in a recently published article . A related epitope, KIQNFRVYYR (KR10), has been predicted based on the HLA-A2 binding supermotif, and this 10 amino acid peptide has been previously studied in HLA-A2-positive long-term non-progressors . Interestingly several study subjects had concomitant responses to Integrase 30 and 31 and expressed HLA alleles different from HLA-A30, suggesting that an additional epitope is contained within the C-terminal half of Integrase 30. It further indicates that the region of the Integrase sequence spanned by overlapping peptides Int-29–30 may be an immunodominant region of the Integrase protein. Fine mapping confirmed the epitope within Integrase 17, a peptide targeted by 9% of study subjects, as the epitope STTVKAACWW (SW10). This epitope was restricted by HLA-B57, an MHC class I allele known to be associated with HIV-1 long-term non-progression, as shown in Figure 3C,3D. All five HLA-B57 positive study subjects in this cohort were long-term non-progressors and recognized STTVKAACWW, suggesting high immunogenicity of this newly defined epitope. The above data indicate that numerous regions of both Protease and Integrase are potential targets for CD8 T cell responses, and suggest regions of epitope clustering. We further evaluated epitope clustering in these proteins through an analysis of primary sequence diversity. As a measure of sequence variability, we calculated the average entropy at each of the 288 amino acid positions within Integrase, based on 155 protein sequences, including 34 clade B sequences, reported to the HIV-1 Molecular Immunology Database . A similar analysis has recently been reported for other HIV-1 proteins . This analysis confirms that within Integrase, a large stretch of highly-conserved sequence exists at amino acids 40 to 100, and three smaller highly-conserved regions exist centered at amino acids 145, 181 and 240 (Figure 4, blue and red lines). Correlation of amino acid sequence variability with frequency of CD8 T cell responses targeting Protease. For Protease, amino acid sequences were obtained from at the HIV-1 Molecular Immunology Database (27), and aligned relative to the HIV-1 clade B consensus sequence. Entropy scores for each amino acid residue were calculated based on this alignment, smoothed over nine amino acids, and plotted for all sequences (n=155, blue line, left axis) and clade B sequences only (n=34, red line, left axis). Entropy scores of 1 correspond to 100% conserved residues, while lower scores (plotted here on an inverse scale) correspond to increasing sequence variability. 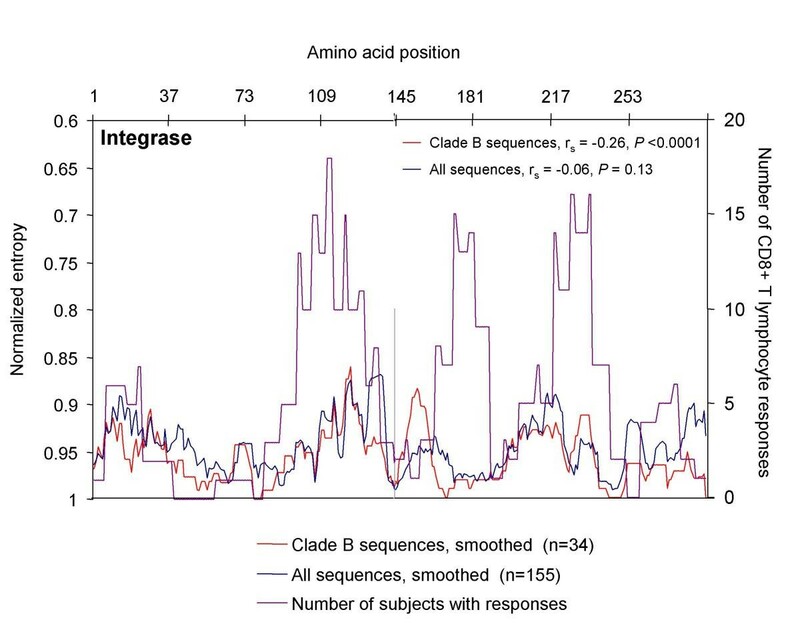 The number of responses in the 56 study subjects against peptides containing each amino acid was also plotted (purple line, right axis) to correlate regions with high sequence variability with regions targeted by CD8 T cells. Spearman’s rank-order correlation coefficient was calculated to correlate CD8 T cell responses against sequence variability for each protein. Correlation of amino acid sequence variability with frequency of CD8 T cell responses targeting Integrase. For Integrase, amino acid sequences were obtained from at the HIV-1 Molecular Immunology Database (27), and aligned relative to the HIV-1 clade B consensus sequence. Entropy scores for each amino acid residue were calculated based on this alignment, smoothed over nine amino acids, and plotted for all sequences (n = 155, blue line, left axis) and clade B sequences only (n = 34, red line, left axis). Entropy scores of 1 correspond to 100% conserved residues, while lower scores (plotted here on an inverse scale) correspond to increasing sequence variability. The number of responses in the 56 study subjects against peptides containing each amino acid was also plotted (purple line, right axis) to correlate regions with high sequence variability with regions targeted by CD8 T cells. Spearman's rank-order correlation coefficient was calculated to correlate CD8 T cell responses against sequence variability for each protein. Frequency of CD8 T cell responses to HIV-1 proteins relative to protein size. The frequency of responses directed against Protease and Integrase in the study cohort are plotted against the size of the proteins, in number of amino acids. Published data from cohorts where the frequency of CD8 T cell responses against at least one HIV-1 protein are plotted for comparison (see text for references). We next compared the entropy at each position with the number of subjects targeting peptides containing that amino acid (Figure 4, purple line). CD8 T cell responses cluster around three regions of Integrase, centered around amino acids 110, 180 and 220. The two clusters at the C-terminal end of Integrase correspond to regions of low amino acid variability, while the N-terminal epitope cluster centered on amino acid 110 overlaps with a region of high amino acid variability. Somewhat surprisingly, the highly conserved region of Integrase in the N-terminal domain from amino acids 40–90 with low sequence variability was largely devoid of CD8 T cell responses. Spearman's rank-order correlation coefficient (rs) and the P value for the correlation between the number of responses and raw entropy was rs = -0.07 and P = 0.11 for all sequences, and rs = -0.61 and P < 0.0001 for clade B sequences. Smoothing entropy scores over nine amino acids did not significantly alter the correlation between entropy and response frequency; for smoothed entropy, rs = -0.07 and P = 0.13 for all sequences, and rs = -0.26 and P < 0.0001 for clade B sequences. 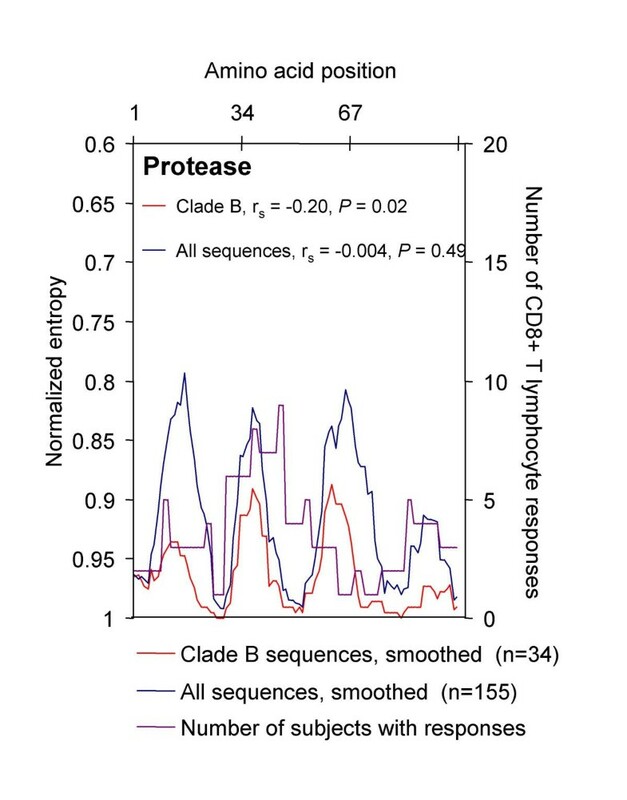 Thus overall, there is a slight inverse correlation between clade B sequence variability and CD8 T cell responses for the entire Integrase protein. A similar analysis was performed for Protease. Notably, Protease has more clearly defined domains of high and low amino acid variability (Figure 5, blue and red lines). As the sequences used to calculate amino acid variability predate Protease inhibitor therapy, this is not the result of drug-induced selection pressure. Confirming this, non-clade B sequences from regions of the world where drugs are unavailable also show three domains with high and three domains with low variability (data not shown). 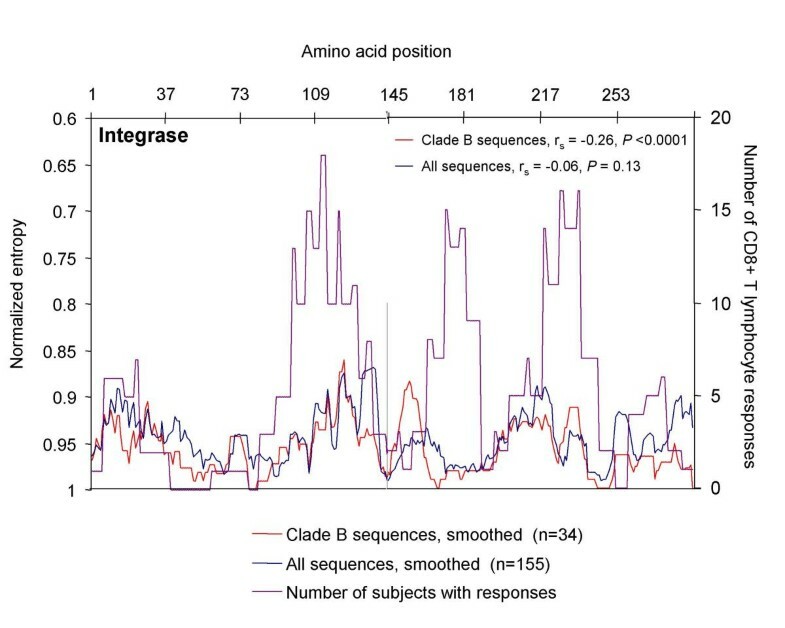 Figure 5 also reveals a slight inverse correlation between CD8 T cell responses against Protease (Figure 5, purple line) and Protease sequence variability for clade B sequences. Both graphically and statistically, this association is not as strong for Protease as it is for Integrase. For Protease, Spearman's rank-order correlation coefficient using raw entropy scores was rs = -0.16 and P = 0.054 for all sequences, and rs = -0.61 and P < 0.0001 for clade B sequences. The corresponding values using smoothed entropy scores were rs = -0.003 and P = 0.49 for all sequences, and rs = -0.20 and P = 0.02 for clade B sequences. It should also be noted that the data on CD8 T cell responses presented here were obtained from subjects many of who were receiving, or had previously received, Protease inhibitor therapy. Because autologous protein sequences from these patients were not readily available, we were not able to assess the impact of prior PI treatment on the subsequent correlation between Protease-specific responses and Protease sequence diversity. Nonetheless, as has been found for other HIV proteins , there appears to be an inverse correlation between clade B sequence diversity and CD8 T cell responses against both Integrase and Protease in the study subjects. We here report a unique and most detailed assessment of the CD8 T cell response against the HIV-1 enzymes Protease and Integrase in a large cohort of HIV-1-infected subjects representing both early and chronic disease. To date, responses directed against two of the three key HIV-1 enzymes encoded by the pol gene, Protease and Integrase, have received limited attention, and the breadth and specificity of responses to these proteins remain poorly defined . We show that both Protease and Integrase are significant targets for HIV-1-specific CD8 T cell responses, recognized by 23% and 68% of subjects in our cohort, respectively. These values are consistent with the frequency of responses targeting other HIV-1 proteins, although lower per unit protein length than more immunogenic proteins such as Gag p17, Gag p24, and Nef. Moreover, we optimally define the three most frequently targeted discrete epitopes within these proteins, and show that peptides containing Protease epitopes overlap with regions expected to be under pharmacologic selection pressure in those persons fortunate to have access to Protease inhibitor therapy. Although studies of CD8 responses to the pol gene product have been conducted [10, 11, 39], few Protease and Integrase epitopes had been described, even in the highly conserved active sites of the enzyme. No epitopes within Protease have been defined de novo in infected persons; those reported to the HIV-1 CTL database have been identified either on the basis of predicted HLA-binding motifs, or characterized only in HIV-exposed, seronegative individuals [31, 35, 40]. Optimal epitope mapping for these epitopes and analysis of the frequency and breadth in HIV-1 infected populations has not been done. Similarly, rigorous optimal epitope mapping in Integrase has not been reported; peptides targeted within Integrase have been identified based largely on predicted binding motifs, as well as studies of exposed seronegative subjects or populations with selected HLA alleles [32, 33, 35, 36]. Our data indicate that both of these proteins serve as frequent targets for CD8 T cells. Significant epitope clustering in Integrase was seen in our study, and these epitopes cluster largely around highly conserved residues in the C-terminal portion of the protein. Interestingly, highly conserved residues in the N-terminal zinc finger domain and the conserved "DDE" catalytic core are largely devoid of CD8 T cell responses . Without sequencing autologous virus, we cannot rule out the possibility that the peptides used in our study to evaluate CD8 responses in the conserved regions of Integrase failed to pick up responses that were actually present in our study subjects. However, because these regions of Integrase are highly conserved, the clade B consensus sequence used to generate the peptides should be a close reflection of the viral sequence present in our study subjects. Identification of factors that might contribute to a paucity of immune responses against a highly conserved region of this protein, such as poor proteasome cleavage sites  or reduced affinity for HLA class I molecules . A recent study actually indicates that the frequency of recognition of a peptide was indeed correlated with the presence of predicted immunoproteasomal cleavage sites within the C-terminal half of the peptide and a reduced frequency of amino acids that impair binding of optimal epitopes to the restricting class I molecules . However, this issue will require further study. The HIV-1 Protease gene is under considerable selection pressure through the use of Protease inhibitor therapy in populations fortunate enough to have access to these drugs. Given the potentially complex interactions between drug selection pressure and immune selection pressure, we determined whether the epitopes targeted by Protease-specific CD8 cells were contained within regions known to mutate in the presence of drug selection pressure. Protease 6, the most frequently targeted Protease peptide, contains the primary mutation site M46 and the accessory mutation site M36. 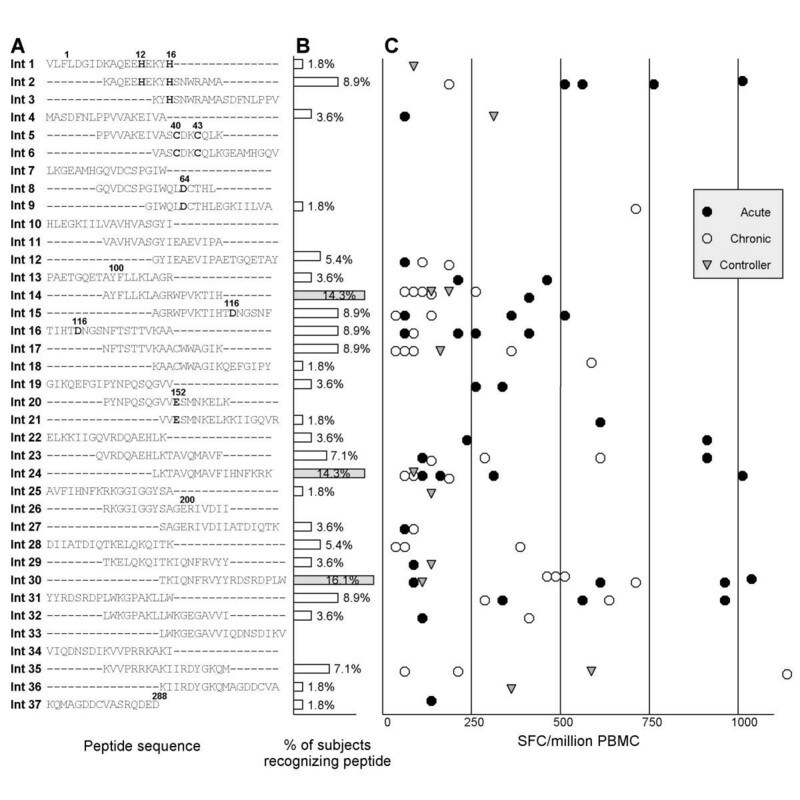 Primary PI mutations at M46, I54, V82, I84, and L90 [44, 45] are clustered in peptides Protease 6 through 9, and Protease 11 through 13 (Figure 1A), all of which contain CD8 T cell epitopes. Because of their relative immunogenicity and highly conserved nature, both Protease and Integrase could be potential targets for vaccines and immunotherapeutic interventions. However, features of the CD8 T cell response directed against each protein should be noted in this context. First, the Protease-specific responses identified here were of relatively low magnitude, even in those who control viremia without treatment. Second, although the Integrase-specific responses described here were of high magnitude, they cluster around three regions of the Integrase molecule, at least one of which falls largely outside of the highly conserved active sites of the enzyme . Further epitope mapping within Protease and Integrase will be necessary to determine the extent of epitopes throughout these proteins, and further delineate the relationship between sequence diversity and effective CD8 T cell responses. The frequent targeting of the Protease and Integrase proteins raises the question as to how immunogenic these proteins are compared to other HIV proteins. Figure 6 compares the frequency of CD8 T cell responses versus protein amino acid length for Integrase and Protease, as well as for all HIV-1 proteins based on published data from large cohorts evaluating the responses against individual proteins [8–10, 24, 47]. Although Integrase peptides were targeted by CD8 T cells in HIV-1 infected subjects at three times the frequency of Protease peptides, comparison of CD8 T cell responses per unit protein length suggests that the relative targeting of the two proteins is similar (Figure 6). In addition, published data on CTL frequencies per unit protein length for other non-structural proteins, including Tat, Rev, and Vif, are similar to Protease and Integrase. 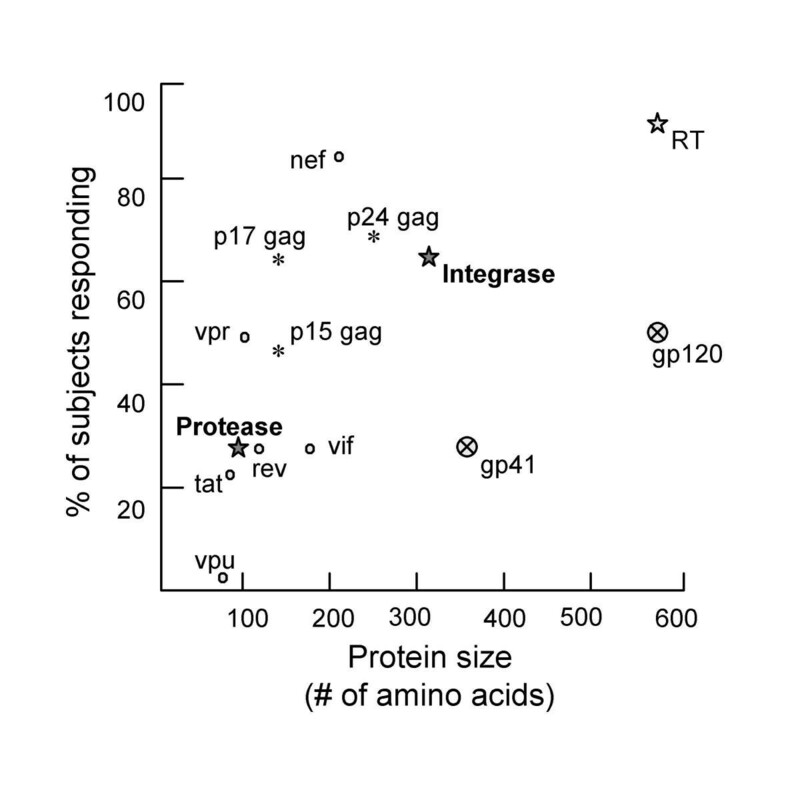 Reverse transcriptase, Vpr, and the envelope glycoproteins exhibit proportionately lower frequencies of CTL induction relative to their number of amino acid residues; conversely, the frequency of CTL responses per unit length of protein to Nef, Vpr, and the Gag proteins appear to be over-represented in HIV-1-infected subjects. There are multiple factors that may influence immunogenicity. Levels of the protein available for epitope processing are affected by the stability of the mRNA, polyprotein or mature protein and the protein's relative cytoplasmic abundance . CTL epitopes are also affected by the presence of proteasome cleavage sites within a protein, sequence variation, the stability of HLA binding and TCR recognition. The role of each of these factors can be difficult to measure. Finally, in our study we did not determine any significant differences in CD8 T cell responses directed against Protease and Integrase when comparing acute and chronic HIV infection. Previous studies have suggested that CTL responses that develop during acute infection may differ from those seen during chronic infection, and that these differences may be important in the ultimate failure of the immune response to control viremia [10, 12, 24, 49]. Responses directed against nef and accessory proteins appear to develop early in HIV infection, until Gag p24-specific responses emerge and dominate the CTL response in chronic infection. The generation and persistence of Protease and Integrase-specific responses do not appear to differ in acute versus chronic infections, although the impact of drug selection pressure on this process remains to be determined. We conclude that Protease and Integrase are frequently targeted by the CD8 T cell response in infected individuals. These responses may be particularly important to examine in relation to viral immunopathogenesis and specific selection pressures as treatment with Protease inhibitors expands and Integrase inhibitors commence. In treated patients, viral sequence within these epitopes will be under selective pressures from two sources, drug and the immune system. Recent data from Moore et al. strongly suggest that HIV-1 sequence variation in individual patients can be directly attributed to escape from CTL, and previous studies in humans and primate models have confirmed CTL escape and its functional consequences [15, 50–53]. Similar analyses have been undertaken on the evolution of virus under selective pressure from Protease inhibitors alone [54, 55]. The dynamics of viral escape during selective pressure from both CTL and from drugs will be critical to examine, and will likely require assessment of immune responses to the autologous virus variants present in vivo to provide further insights regarding HIV immunopathogenesis and vaccine development. William R Rodriguez, Marylyn M Addo contributed equally to this work. The authors would like to thank the study subjects for their participation. We are also indebted to the dedicated research staff at the various clinical sites for their recruitment efforts. This research was funded by the National Institutes of Health (R37 AI128568-BDW, ROI AI50429-MA), the Doris Duke Charitable Foundation (MA), Concerned Parents for AIDS Research (CPFA) (MMA), the Partners/Fenway/Shattuck Center for AIDS Research (XGY) and Howard Hughes Medical Institute (BDW). B.D.W. is the recipient of a Doris Duke Distinguished Clinical Scientist Award.